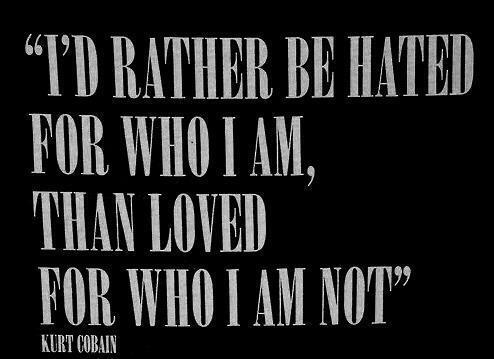 Those of you who follow me probably know all about my love affair with all things 90s and grunge. 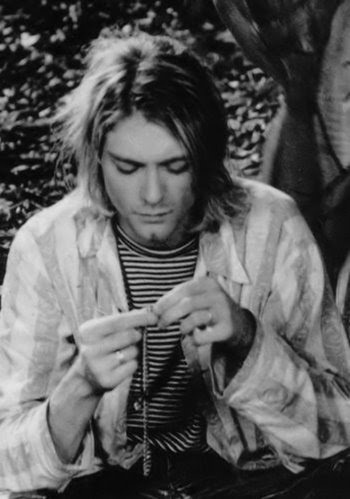 Since today is Kurt Cobain's birthday (he would have been 46 today) I wanted to talk about how this decade influenced my life and style today. I often find myself wishing that I'd been born earlier. A part of me dreams of a life in the Swinging Sixties - I would SO have been a groupie (I mean a real groupie with style and dedication, not the sad "Victoria's Secret didn't want me so now I'm stalking rock stars" wannabes we have today). Another part of me is secretly wishing to go back in time as a Seventies flower child. But the decade I most identify with is one when I was actually alive, even though way too young to appreciate it for what it was - the 90s. I was eleven when Kurt died, so I never got to experience the whole Nirvana thing and that makes me so sad. There are few things I wouldn't give to be at the MTV Unplugged show (IMHO the greatest concert of all time, tied with Queen at Wembley Stadium). But even so, as a kid my style influences came from a grungy place. My biggest fashion inspirations in the 90s were Alicia Silverstone and Liv Tyler in the most amazing music video ever, Aerosmith's Crazy, wearing little slip dresses, cut-off denim shorts and Dr Martens. I worshipped them. And Angela Chase. 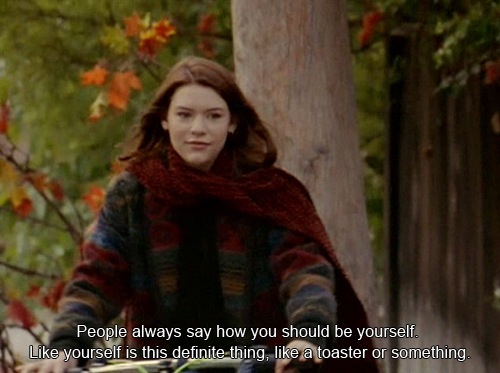 I LOVED Angela Chase. I WAS Angela Chase. My So-Called Life was like someone had written a TV script about me and let a way prettier girl star in it. I, too, was a weird outcast at school, too shy to talk to the guy I liked (of course, if Jared Leto went to my school, I'd be as outspoken then as I am with him today on Twitter. Too bad he never notices. I guess I'm still a bit of an Angela). 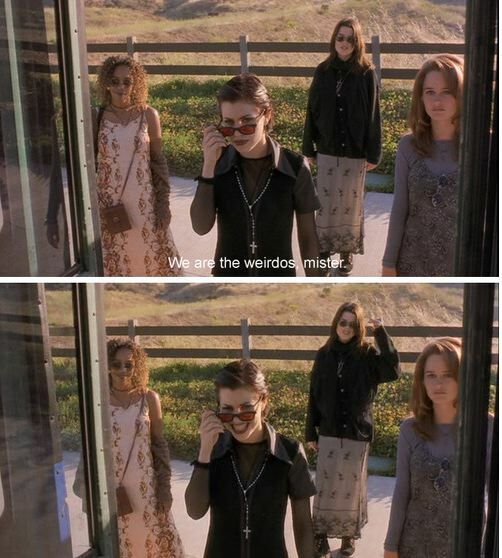 My favourite movie was The Craft - I so have to watch that again - I bought the video since I was only 13 and could see it in the cinema due to its over-15 rating. I loved the four girls' style, especially Sarah (Robin Tunney). I found her gorgeous. I even remember buying a huge black cross choker necklace and wearing it with a white shirt. I wanted some black lipstick, but I didn't think my mum would let me out of the house like that. Growing up and meeting David was a huge turning point for my taste in music - let's just say I didn't really have one before him. He was the one who first started me listening to Nirvana but these days my Kurt obsession is way beyond where his admiration ever was. I own two Nirvana t-shirts (one with the NME cover from when Kurt died), have read countless bios and am even learning to play The Man Who Sold the World on the guitar (although I wouldn't brag too much about that since I am spectacularly bad. But, you know, I try). And although I've never been a fan of Courtney Love, I have to say their style as a couple was generation-defining, style-wise as well as musically. In the process of finding my style, I've settled on a clean minimalist with a touch of rock chic. 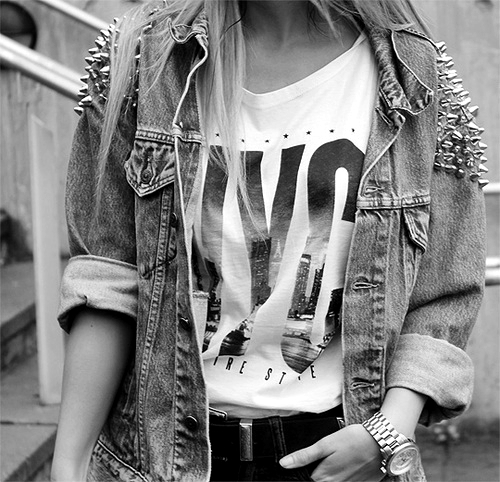 If you meet me, you wouldn't think "grunge girl" straight away, but you'd notice there's always a rock n'roll touch to me, whether it's my biker boots, my spiky bracelets, my studded earrings, my rock band t-shirts or my ripped jeans. And I think I owe the 90s for that. No, non l'ho visto! Lo cercheró, grazie! I loved My so-called life! I wasn't even a teenager but I watched every episode, and would sit still in front of the tv waiting for it to start. And do we have to talk about black lipstick, I wanted it so badly but couldn't find it anywhere, it got to the point where even my mom was helping me find one. 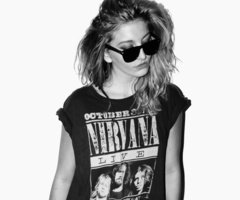 I was in my late teens at the beginning of the '90s so I lived through all the Nirvana scene. It was a great time. I remember getting 'dressed up' with my girlfriends and dancing the night away with messy long hair, chunky boots and billowing maxi skirts, big baggy jumpers (preferably with holes in the cuffs) and denim or leather jackets! We had a blast. Sometimes I long for those days again. Finally enough my brother has just lent me the box set of My So Called Life and I can't wait to wait it again! Wow, a My So-Called Life box set? How many hours of Jared Leto is that? I have to get one. I was born in 1990 so my memories of the 90's are slightly vague but when I see videos, pictures, fims and listen to music from the 90's it really does stand out as one of the best decades there ever could have been! even if it was really grungy and cheesy at the same time haha! Grazie per questo bel post che mi ha fatto tornare a Liv ed Alicia, alle mitiche Doctor Martens e a lui, Kurt, sempre nel mio cuore. Anche gli anni '90 con il loro grunge avevano il proprio stile!